To honor the upcoming Earth Day, this week’s Weekly Photo Challenge bears the title “Earth” to celebrate this planet on which we live. For me, the ethereal atmosphere in Antelope Canyon perfectly symbolizes the beauty and perseverance of nature. The powerful flow of water once carved out these slot canyons in the barren landscape of Utah over the course of thousands of years, and the sun shining into the narrow canyon has created the magic beams of light in the past and will continue to do so for all future. Let’s all join in protecting the magic of our planet earth. Photo taken with a Canon Power Shot G12, image specs 0,6 sec @ f/8 and ISO 100, camera was mounted on a tripod. Thanks, Sonia! Sorry you missed that, but nature some times has its own plans. Wish you more success next time! Gorgeous! Did you have to utilize a Navajo guide? Any logistics advice for visiting the area? Thanks! Yes, we did utilize a Navajo Guide. 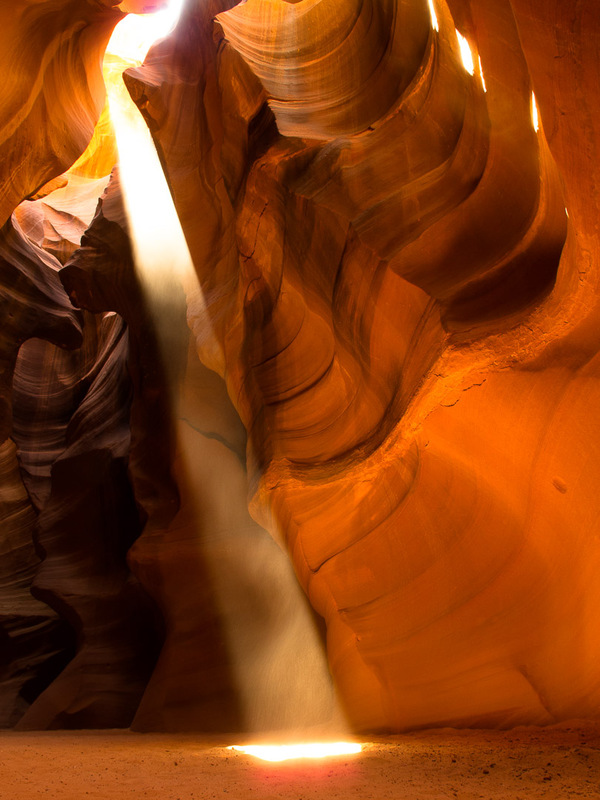 To capture the light rays in Antelope Canyon, it makes sense to book a tour around noon. That also leaves time to visit other nearby slot canyons like Rattlesnake and Owl earlier in the morning. Also, I recommend to book a photography tour. You can take your tripod inside and the Navajo guides do a great job, roping off other visiting groups for a few minutes so you can take these marquee shots in a seemingly empty canyon. How do you participate in the weekly photo challenge? That was in lower Antelope Canyon. And yes, it was the noon photography tour we were on. Thanks for commenting 🙂 ! Amazing photo, reminds me of an abstract painting. Thanks so much, Regina, your kind comment means a lot! Thank you for your kind words, Melissa 🙂 ! Thank you for you great comment :-), it means a lot! The Arizona slot canyons are a must see indeed. We visited Page and Antelope Canyon on our move out to California. It was one of the neatest experiences! I got some beautiful images, but none with the rays of light. Beautiful! Thanks, Vicki, very much appreciated! Glad you had a chance to see this marvel youself! Magnificent, Marcus. What a gift. You are so welcome, go and see it! There are a few other canyons like Rattlesnake and Owl who are also very beautiful. And in Rattlesnake we actually saw a Rattlesnake 🙂 but it was early in the morning and it wasn’t moving.